Rambling Teacher's Blog: Should kids learn times tables? Should kids learn times tables? Knowing that I teach year seven mathematics, people often ask me my opinion on whether kids should learn their times tables (or multiplication tables if you prefer). 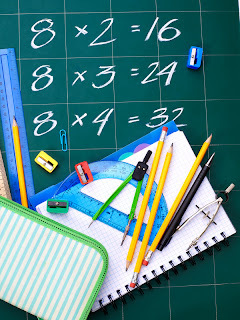 In this post, I argue that times tables should be learned at some stage of the child's education, but only as part of many ideas related to multiplication. The commutative rule: A child is more likely to know that the numbers being multiplied can be reversed without affecting the result if they can remember a time when they found that the same number of counters could be laid out in 8 groups of 3 or 3 groups of 8. Abstractly, 8x3 = 3x8. The distributive rule: Kids need to know that 3x15 is the same as 3x10 + 3x5. Better still, they should know that 3x15 is the same as 3x10 + half that amount (since 5 groups contain half as much as 10 groups). This skills will serve them well even after they know their times tables. No child should say, "I cannot tell the answer to 7x17 because we have not been taught the 17 times table." A combination of the above two laws: Having worked out the answer to 3x15, a kid should know that finding 3x17 simply involves adding 6, 2 groups of 3, to the previous answer. The relationship between multiplication and addition: 3x8 is another way of saying 8+8+8. The relationship between multiplication and division: if 4 groups of 6 make 24, then it follows that 24 objects can be separated into 6 groups of 4 or 4 groups of 6. Factorising (factoring): a student needs to know the highest common factor of two or more terms, eg: factorise the expression 8y + 12. Students who cannot do mental arithmetic are often behind their peers in all areas of mathematics and have lower confidence about their chances of success in the subject. They count on their fingers, a painfully slow process about which they are usually embarrassed in front of their peers. Those opposed to students learning their tables tend to hold all uses of memorisation in low regard. I disagree with this view. We have memories for a reason and, as long as we are not using memorisation as a substitute for understanding, I do not see the harm in it. Do you think that kids should learn their multiplication tables by heart? Thanks for this. As a parent, it is useful to get some pointers on ways to make rote learning of the times tables more relevant. Thank you for your comment, Anonymous. I had written the post with parents in mind. Thank you for the comment, Jaide. I have taken a quick look at your blog and it looks like a worthwhile read. I will visit again soon. When should children learn to walk? or to talk? Or, when should children learn quadratic equations? Or surds? Or about geometric intuition for the tensor product of vector spaces? What criteria separates needing to learn to do something from learning something because we might need to? Because it is part of the curriculum? Government expectations? Parent expectations? The need to fill in the school day? Or because we had to learn it when we were at school? I don't disagree with anything you've written, it is just that you never answered the question as to why anyone needs to learn fractions.... because maybe the answer to how and when comes from there. Thank you, Anonymous. You are right that, in this post, I did not discuss whether the curriculum should include certain topics. I took the school curriculum as a given. The post was simply an answer to the question I get asked by parents who want their students to succeed in high school mathematics (years 7 to 12 in Australia). As for whether fractions are needed, my answer is yes but certainly not to the extent covered in the school curriculum. I see little point in fraction operations and in mixed numbers. A good sense of partitioning and "equivalent partitions" is much more important. I want to apologise for not publishing your comment earlier. I had missed the email notification that it was awaiting moderation. I just wanted to endorse your notion that it is only necessary to learn the times tables up to ten. For early 30 years I have bucked against the archaic notion that times tables should be memorized through the twelves. I believe memorization through the 12s actually hampers a more complete understanding of multiplication, because, a) it creates a false idea that somehow mutiplication beyond the 12s is somehow more difficult than the twelves, and b) it fails to imbue children with an understanding of the Distributive Property. Nothing beyond the 9s are necessary to use the standard multiplication algorithms, and the tens are necessary for understanding the significance of place value. Anything beyond that is, at best, a waste of time.